Class is OPEN! Now and Forever! This is a comprehensive drawing course made exclusively for beginners. And then this cool girl!!! We continue to loosen up in a quick scribble art exercise! And after we understand line weights, we will progress to talk about and implement the value scale. In addition to simple shapes, we will expand upon our understanding by learning to draw simple objects using our value scale! And then once we get the hang of that shading, the where and why's, we have quite a bit of fun! And then a wee bit more! And after we've had a chance to come up with some cool cards for pals, it's back to business for a bit. We next learn how to depict flowers and faces, my all time favorite things to draw. As I teach you to learn how to draw what you see in real life, we will also go over whimsical vs. realistic drawing styles and how to find out which one is for you! 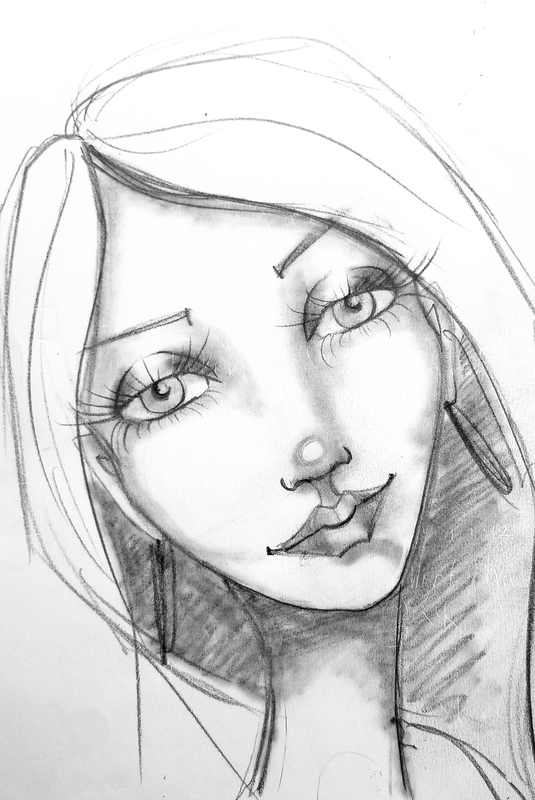 Next you will learn how to understand and implement the proportion of a realistic face vs. a whimsical one! First we learn the features of the whimsical face and how to draw them! In not just one way...but two! And then you will learn, step-by-step, how to draw realistic eyes, nose, mouth, ears and hair! Instruction consists of several hours of real time instruction, time lapse inspirational videos and PDFs. All students will be offered full support in the Facebook Group page for this class. My good friend Claudia Finelle, an accomplished artist from NC, will be guest teaching in this module! Students may follow this and all other courses at their own pace. All videos are full downloadable and ownable once you sign up so feel free to use them and enjoy them for a lifetime with my blessing! Just please, no sharing. I would LOVE to see what you're working on and how you're doing so PLEASE check in the Facebook Group (Awesome Art School) to say hello and post your progress! See you there! ~ 11+ hours of video time PLUS additional PDF's.